“Dr. Louise Banks” (Amy Adams) is a renowned professor of linguistics. She is in the middle of teaching a class when “they” arrive. They are 12 extremely large spacecraft that spread out across the Earth. Because of her previous work for Army intelligence, and the fact her higher than Top Secret security clearance is still active, she is recruited by “Colonel Weber” (Forest Whitaker) to work with others to try to decipher the language of the aliens. Unknown to the public until later when photos of the interior of the ships are leaked, each of the 12 spacecraft open up at periodic intervals. At each of the sites scientists go inside to try and communicate with the aliens. Working with a top theoretical physicist, “Ian Donnelly” (Jeremy Renner), Dr. Banks manages to make breakthroughs in understanding the written language of the aliens. They are visible through a transparent wall inside the spacecraft but physical contact is not possible. The scientists label the aliens as “heptopods” because of their physical appearance. Dr. Banks and Ian come up with interesting nicknames for the two heptopods inside the spacecraft at their location in Montana. Tensions around the world rise quickly to panic levels, and the posture of “General Shang” (Tzi Ma), leader of the People’s Liberation Army of China isn’t helping. He is making dire threats about destroying the vessel that landed in China. As Dr. Banks and Ian make more progress in understanding the language of the aliens, she also begins to have what seem to be flashbacks of encounters with her daughter, “Hannah” (played by several different young actresses at the various stages of her life). These flashbacks may or may not lead to the answer to the big question. Are the heptopods here to unite us, or to tear us apart? As tensions are further inflamed and the satellite communication links between the twelve sites are taken down, it becomes even more urgent for Dr. Banks and Ian to solve the mystery. This is smart sci-fi movie-making. 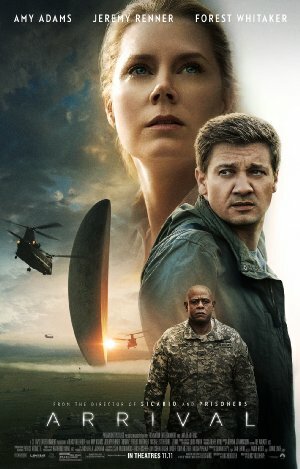 Based on an award-winning sci-fi short story written by Ted Chiang, director Denis Villeneuve and screenwriter Eric Heisserer worked to film their film with “real” science to go with the story’s fiction. Few films will properly tell a story involving Fermat’s principle and make proper distinctions between written languages that are and are not based on the sounds of the spoken language. Amy Adams and Jeremy Renner are very good, together and separately in this movie. Some might say that this is one of her best efforts yet and when you consider that she is already a five-time Academy Award nominee, that’s saying something. Sadly, the tremendous talents of Forest Whitaker are wasted here, given his limited moments onscreen and the ever-changing accents in which his lines are delivered. Ultimately Arrival is uneven. Brilliant in some sequences, and pedestrian in others. Overall, it’s above average but not the stellar interstellar sci-fi epic it might have been. The prototypical paranoiac CIA operative (Michael Stuhlbarg) does little to drive the story and his presence is very formulaic. The slightly under two-hour running time works in the film’s favor, as there aren’t any lingering exteriors or other wasted moments that excising would have made this a better movie. In the end, it is worthwhile to arrive at the auditorium to see Arrival. Plot: A linguist is recruited by the military to assist in translating alien communications.